A record 4,816 women jammed the streets of downtown Albany for the 33rd running in which Mamitu Daska dominated. She had finished second in 2009 and third last year. After the long climb up Madison Avenue Daska went to the front and was never headed. Last year's winner Emily Chebet and the emergent Aheza Kiros from Ethiopia stayed close to start with but Daska's strength eventually told. Chebet tried to close and in doing so moved ahead of Kiros, but she soon lost her advantage as she weakened towards the end. "I could tell that they couldn't keep up after the first mile" commented Daska, "so I kept going." The race also saw some breakthrough US performances. Alissa McKaig stole fourth place just before the line from local favourite, Megan Hogan. In doing so, McKaig became the highest-placed American since this race was opened to international runners in 2005. On a humid morning in Bangalore the two separate elite 10km races played out very differently. Philemon Limo made a decisive break before the 4km point to build up a lead which he never lost, although he slowed from 27:30 pace at halfway to record 28:01, 10 seconds slower than the course record set by Zersenay Tadese in 2008. By contrast the women's race started slowly, with a large group staying together until late into the race. Dire Tune won in the final sprint, recording the same time as Merima Mohamed, with the next three to finish also pressing very close. Peru's Constantino Leon and Ecuador's Diana Landi concluded a weekend-long festival with victories in the 51st edition, writes Alan Brookes. It was Leon's first victory in four attempts, as he ran a smart race to cross the line inside Estadio Olympico after a thrilling duel with hometown favourite Segundo Jami. Landi broke away from fellow-Ecuadorian, Sandra Ruales and Kenyans Rose Jebet and Neria Asiba at 3km, to easily defend her title. Mexico's Karina Perez came through to take a distant second place. The event was founded a half-century ago by then-President of Grupo Comercio, Jorge Ribandeneira, who still comes out on Race Day, even though El Comercio's dynamic Sales Manager, Pablo Gonzalez, has taken over as Race Director. It began as a gift from the newspaper to this city of 1.4 million, that sits directly on the equator at 2850m above sea level. 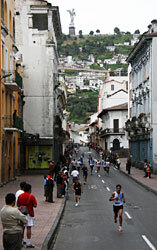 With 15000 participants it has grown into the largest road race in Ecuador, and has been embraced by the community as a festival that goes far beyond running. The event showcases the best of Quito and the warmth and generosity of its people. Conditions were ideal for the 09.00 start in front of the El Comercio/Ultimas Noticias offices on San Bartolo — overcast and 10°C. New York-based Ethiopian Alene Reta and Mexico's Hugo Romero took a pack of 11 through an ambitious first, uphill kilometre in 2:51. The lead group hit 5km in 14:48 and were then faced with a long, twisting climb up Avenida Moldonado and Loja. At the top Segundo Jami made a bold break, quickly opening up a gap of 50m. I felt good, said Jami. I felt comfortable and very strong after the hill. And the cheers of the crowd encouraged me to take the risk. Jami maintained his lead all through the Centro Historico — the first UNESCO designated World Heritage site — through Plaza Santa Domingo, with picturesque El Panecillo as an imposing background capped with its 30m statue of the Virgin of Quito, past Palacio Municipal, Iglesia San Augustin and Plaza del Teatro, and into New Town. He passed 10km in 30:09, but in the 14th kilometre Leon closed the gap and moved past decisively. Leon trains at the 18-month old High Performance Training Centre in Huancayo, set up by the Peruvian Ministry of Sport, for marathoners. Leon credits their new Korean coach with improving their training, with more quantity and quality — but also in teaching them to run smarter, tactical races. Last year I went too hard on the hill, and paid for it later, finishing fourth. This year, I wanted to run smarter and win. I dropped back to 5th or 6th on the hill and let the others go a bit, he said. I felt under control from that point. Jami, the second child in his family, was still pleased with his second place, and was a hero to the thousands of spectators who packed the course and Estadio Olympico. He was even a little philosophical after. 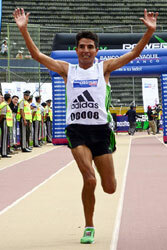 This was his second 2nd place at Quito Ultimas Noticias 15K. His father has also come second three times in the race. I think I will name MY son 'Primero' he joked. In the early morning runners stroll and stretch before the start of the second Mauritius Marathon writes Wolfgang Slawisch. We are a mixed crowd: Serge from Mauritius, mixing it with foreign competition; Esteban, an Emirates flight captain from Costa Rica; Caroline from neighbouring Réunion, supported by her family; Helgaard and Heather fresh from a Comrades Marathon finish; and Britons David and Linda who collect exciting Marathons. For me it is 12 years since I was here, helping to organise a previous Mauritius Marathon that lasted only three years. I would like to help this new version to last longer. For the first 5km we run towards the rising sun. The impressive Morne Rempart reminds me of the Matterhorn. At Tamarin, the turning point, I manage the first 70m ascent as we pass Mauritians waking up to the day. The most scenic part of the course is from Black River to Le Morne, where this impressive mountain massif rises 500m sheer out of the sea. As the road continues to climb and descend one runner after another overtakes me. Most offer a smile and a cheer, ensuring my resolve to finish. I stop at a roadside shop to buy an ice cold drink. It stops raining, the sun breaks through the clouds and my mood brightens. Waves thunder against the distant reef, whlle surfers ride them closer to the shore, and the sight of the beach lures me on. One more ascent and the village of St. Felix appears. Soon I can hear shouts and cheers from the finish line along with Mauritian Sega music. A beautiful Mauritian woman gives me my medal, I can enjoy drinks and refreshments, but I head straight for the turquoise waters of the Indian Ocean. The 15th edition opened not with the traditional children's races, but with a babies' race. About 40 babies crawled 5m to reach the finish line. Then the children's race started featuring an honourary competitor who was not a child — AIMS President Paco Borao. Although he did not win, he did present the medal to the winner. There was great spectator support as usual for all 12 of the races, from babies and children's to the main 10km race at 18:00. It was windy and the temperature was 23°C, but the winners recorded great results. The first 5km was very fast but they slowed in the second half due to the wind. Kimutai Kiplimo led from the start while in the women's race Tadelech Bekele Alemu overtook Pamela Chesopich Lisoreng to win the race in the last 300m. 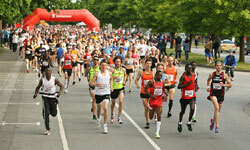 In all more than 6000 participants took part and in the senior race 200 of them came from 15 countries. Resident Kenyan Kip Kangogo, and Washington State's Ruth Perkins ran intelligent races to claim victory in the 13th edition writes Alan Brookes. 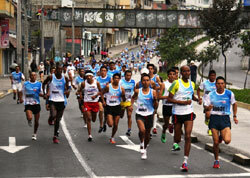 A record field of 4815 participated, with another 1396 in the 5km. Weather conditions were good at the 07:00 start: windless and 12°C. Kangogo's win was his third in a row and his fastest time on the scenic course. Kangogo led from the start, heading a pack of eight at even three minutes per kilometre pace. After 7km [21:03] Matt Loiselle started to push, reducing the group to three as Dylan Wykes and Willy Kimosop dropped back. Loiselle, Kangogo and Rob Watson passed through 10km in 29:37 before Watson slipped back and Kangogo strategically tucked in behind, allowing Loiselle to do the work until the pace began to slip approaching 15km (44:55). 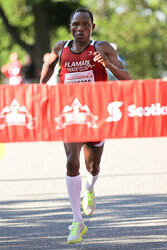 Kangogo let rip going up the rise on Burrard Bridge from 18-19km, covering the following downhill kilometre in 2:34. Loiselle was rewarded with a personal best time. The women's race was a test between youth and experience. 21 year-old Keddi-Anne Sherbino burst onto the scene with two winning marathons, but had to settle for sixth place two minutes behind winner Ruth Perkins who showed guile and patience in seizing her chance. Natasha Wodak and Kate Vaughan made the early pace but at 34:34 for 10k Wodak admitted it was far too fast. Yet she still ended up five minutes faster than in her only other half marathon. Perkins meanwhile bided her time, running with Vaughan and only starting to chase Wodak after 10km. Wodak suffered after 14km and Perkins caught her around 18km going onto the uphill of the Burrard Bridge. Vaughan also passed Wodak to finish just 10 seconds behind.